When assembling an emergency kit, it’s vital to make sure that you’ve planned ahead and included enough food and supplies to keep your pets safe and fed. During the evacuation preceding Hurricane Irma, people weren’t allowed on flights out because they didn’t have a carrier for their pets — something that may not be on the top of your packing list if you’re rushing to get out of an area before or during a disaster. Emergency response teams understand how important it is to plan for pets as well: after Hurricane Floyd in 1999, the first SART (State Animal Response Team) was founded in North Carolina, with the first CART (County Animal Response Team) following shortly after to make sure that furry friends were safely evacuated so that their owners wouldn’t stay behind and put their own lives in danger. It’s not just household pets that need to be either evacuated or contained during large-scale disasters: before Irma, there was concern that alligators would get loose from parks, wreaking havoc post-Hurricane. So, assuming you’re probably not the lucky wrangler having to watch over dangerous predators before a hurricane, let’s talk about how to prepare yourself and your family pets for an emergency or natural disaster. Keep two backpacks in your car: one for you, one for your pet. Identifying information. Keep your pet’s vaccination records, microchip information, your veterinarian’s number, and any other information that could prove useful. Store in a ziplock bag or other waterproof container. Food. Wet food in cans will last longer than dry food, but you should keep airtight containers of dry food around to refill and grab on your way out of your home. Be sure to cycle out canned food from your emergency supply every six months. Water. Keep water in containers that won’t break and are air-tight. Don’t forget to include expandable bowls so your pet can eat and drink out of a clean container. Medications with instructions. Store up to three weeks of medications, and be mindful of expiration dates and cycle out when needed. Pet carrier. If you have a smaller pet, purchase a collapsable carrier that can be stored in a backpack in case you need to grab them and get out to a safe location quickly. Otherwise, be sure to store a lightweight plastic or metal crate in an easily accessible location. Extra leashes, muzzles, and obedience aids. In the event of a disaster, your pet may agitated or upset. Be sure to store extra leashes, muzzles, or other obedience aids in your pet’s emergency kit. Booties to protect paws. Protect your pet from broken glass or other debris that may be littering the ground after a disaster with a pair of well-fitted booties. A pet first-aid kit. Make a first aid kit similar to yours, but for your pet: tweezers, bandage tape and scissors, regular bandages (make sure you get smaller bandages for smaller pets), antibiotic ointment, saline solution, and a how-to pet first aid book. Litter pan with extra litter in a sealed container, small plastic bags, handy-wipes. Be sure to carry any of the sanitary items you need depending on your pet. Blankets, heat source if necessary. Depending on climate, be sure to bring blankets for your pet or a small battery-powered heater if needed. Every household should create a disaster plan, which should outline steps for how to evacuate yourself and pets before or during a disaster. Getting accurate, up-to-date information is a key part of your disaster preparedness plan, so make sure you have a contingency plan and a solar-powered cell phone charger on hand. Your pets will be calmer in a home environment, which is why it’s best to go to a friend or family member’s house outside of the evacuation zone, or to a hotel that is pet friendly. If all else fails, go to an evacuation shelter set up by the Red Cross or your local county. However, not all evacuation shelters take pets, so contact your local Office of Emergency Management (OEM) to learn about where to take your pets in the event you need to go to an evacuation shelter. The County Animal Response Team (CART) in your area is the organization that runs disaster shelters, and they also have outreach programs with more information about how to safely evacuate your pets. Bring pets indoors, and keep them crated or leashed. Have newspapers on hand in case you need to use them for sanitary reasons. Feed animals their moist or canned food first to preserve water and help keep them hydrated. Keep as much fresh water as you can store in your home. Understand your pet may be agitated. In the aftermath of a disaster it’s best to keep your pet in their crate in a quiet room while you go through your house as the environment and scents that they are familiar with may have changed. Use bottled water until you’re sure that water quality has returned to normal. 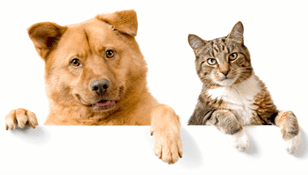 Look for mold and water damage before you (and your pets!) move back in. If you run out of pet food and can’t find any at the supermarket, contact local shelters that often have pet food banks. Preparing for a disaster takes some time and careful planning, but it’s worth it to protect our furry friends. The post Preparing Your Pets for a Natural Disaster or Emergency appeared first on Love That Pet.